Foster received her B.A. from Aquinas College and her M.F.A. in creative writing from Goddard College in Vermont. She has taught poetry workshops throughout Michigan and is the author of six collections of poetry, including: A History of the Body, A Modern Fairy Tale: The Baba Yaga Poems, Trying to Balance the Heart, Contemplating the Heavens, and Living in the Fire Nest (a finalist for the Poet’s Prize sponsored by the Roerich Museum in NYC). Her poems have appeared in more than 250 journals and magazines in the U.S. and Europe such as The Georgia Review, Nimrod, and International Poetry Review. Foster’s newest book of poems, Amber Necklace From Gdansk, was published in 2001 by the Louisiana State University Press and has been nominated for a number of major books awards, including the Laughlin Award from the Academy of American Poets, Paterson Poetry Prize, and the Phi Beta Kappa Poetry Award. In 2003, it was selected as a finalist for the Ohio Book Award in Poetry. 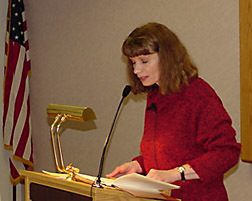 Foster currently lives in Grand Rapids and in 2003 she was selected to be that city’s first poet laureate. If you encounter accessibility issues with items on this page, please contact our remediation service.